Stützpunkt Blokhus was built in 1943 to protect the road leading inland towards both Brønderslev and Aalborg. The layout can be seen more in Denmark. Beach defences, a Festungspak covering the entrance to the Stützpunkt on the land side, two Sechsschartentürme and two mobile Pak guns with support like a kitchen, hospital and loads of personnel bunkers. Two L 409A Flak emplacements were built against low flying enemy aircrafts. Some bunkers were either demolished or covered for a big holiday hotel and spa but most of the bunkers remain and are in pretty good shape, but on private property, so ask for permission before entering. 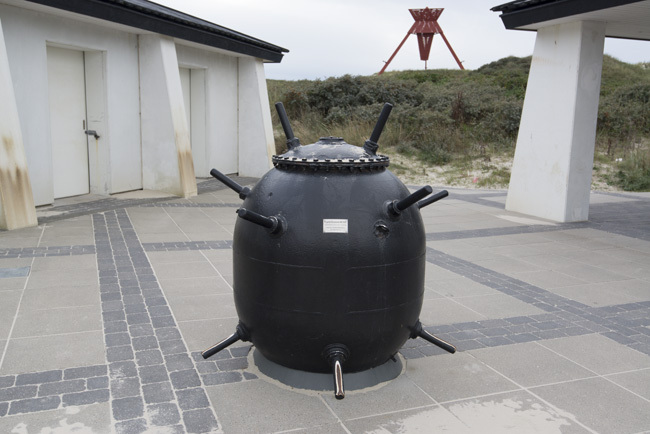 English sea mine stranded in Blokhus.